For those special moments when "likes" aren't enough for your closest Facebook friends, the social networking website has introduced a new gifting program starting today. Different from the virtual gifts program introduced a couple of years ago, Facebook Gifts enables users to easily ship physical presents to one another without having to leave the comfort of their newsfeed. 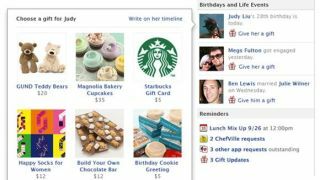 It all starts with by clicking a gift box icon in their newsfeed's birthday reminder sidebar or on their friend's timeline. Cupcakes, teddy bears, and gift cards are just some of the examples of what users can expect to receive if they have a particularly persistent secret admirer. "There are over a hundred partners offering hundreds of gifts," a Facebook representative told TechRadar. "Partners include Starbucks, GUND, Magnolia Bakery in NYC, Magnolia Bakery, Happy Socks, Vosges Haut-Chocolat, The Honest Company, Cheryl's Cookies by 1800 Flowers ($5 cookie greetings), Malin + Goetz and Chocomize." The real gift may be for Facebook. The company has struggled to monetize its increasing mobile traffic, said to be more than half of the visitors accessing the website on a daily basis. "This is truly the heart and soul of Karma, re-imagined inside of Facebook," said Lee Linden, head of Facebook Gifts, in an interview with AllThingsD. "And it all works perfectly on the phone." Yes, Facebook Gifts will work the same way on a tablet or phone as it does on a computer. It won't be a newsfeed-cluttering annoyance either and should make Facebook money in the end. This win-win extends to Facebook gift givers, too, who have almost all of the work done for them. "Choose a gift, attach a card and send," Facebook said in a news release. "You can post your gift to your friend's timeline or send it privately. Your friend can then unwrap a preview of the gift and it will show up on their doorstep a few days later." In addition to taking care of the shipping, Facebook gives them the option to pay right away or add payment details later on. They don't even have to worry filling out an address form, as the friend provides it. Putting the gift-receiving friend in charge of the address is good for two reasons: it keeps their location anonymous (just in case), and it allows them to control where things go (if they recently moved, for example). They can also be put in charge of choosing the flavor, color, and size, great for guys who don't want to "go there" with that question. Exchanging the gift for something of equal value is also possible - no hard feelings or frowny emoticon faces. In a surprise move, this Facebook Gifts idea is friending Android before iOS. However, most users won't notice any gifts no matter which mobile platform they utilize. "Facebook Gifts will roll out gradually, first to people in the U.S.," Facebook's release said. Everything from Facebook Chat to Timeline has followed this slow release pattern. Facebook also told TechRadar that Apple fans should expect "a wider roll-out to iOS devices in a few weeks." In the meantime web and desktop versions are available to select users.